Battery 3 Tutorial, Multimedia/Video Pedagogical Aid from Ask Video. 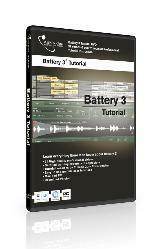 Ask Video Interactive Media has released Battery 3, a new DVD Tutorial designed to help new and experienced users alike master the new version of Native Instruments' drum sampler. Ask Video tutorial expert Chris Butcher takes users through Battery 3 in this DVD tutorial for Mac or PC. He shows users how to get the most out of the 12 gigabyte sample library that comes with the program as well as how to build drum kits from their own samples and loops, including REX files and a number of other formats. Butcher takes the user from setup to mastery in 31 videos for more than 3 hours of video instruction, with examples. Beginning with chapters such as Master Section Tour, Edit Page Tour, Loading a Drum Kit, and Audio and MIDI Settings, he then progresses into chapters on Controls, Using Cells, and Constructing and Mapping Your Own Kit, before delving into advanced topics like Wave Editing, Modulation, Effects and Quantization. Ask Video's interface divides the DVD into chapters for navigation to specific topics or techniques. Battery 3 is now shipping for $39.99 USD each. Ordering information is available at www.askvideo.com. Spitfire Percussion Spitfire Audio recently released Spitfire Percussion, which is described as "the ultimate orchestral percussion library". XILS-lab Updates XILS 3 XILS-lab has announced that updated versions of XILS 3 are now available. Markus Fiedler Dino Isa Denoiser Fiedler Audio has released Dino Isa Denoiser, a plug-in for broadband noise reduction in analog style.